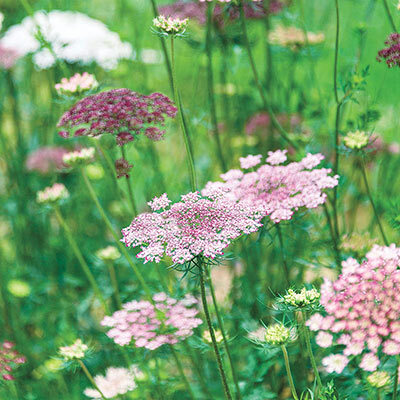 Resembling elegant Queen Anne's Lace blooms, the more colorful Dara Carrot Wildflower grows up to 3 ft. tall and produces plenty of multicolored clusters. Pretty pink buds open into white flowers that mature to soft pink and then to a rich, deep red. They make a stunning addition to the garden or any naturalized setting. Plus, Dara Carrot Wildflower is highly attractive to beneficial insects such as lady beetles and lacewings, which help protect gardens against destructive aphids. The flowers are prized in bouquets and fresh cut-flower arrangements. Blooms in summer. For best results, plant the seeds in full sun. 75 DAYS. Zones 3-9.